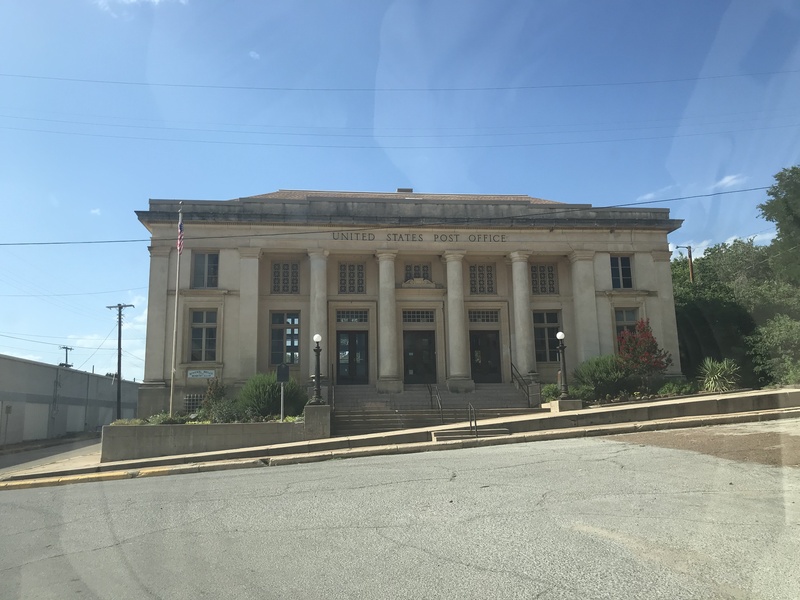 Saturday afternoon, the family and I decided to all pile in the car and go visit a small town, Mineral Wells, located about 80 miles west of Dallas. I was going to fly there initially earlier that day, but a mechanical problem forced me to turn back. Not a problem – we as a family love road trips, even in this sweltering summer heat! 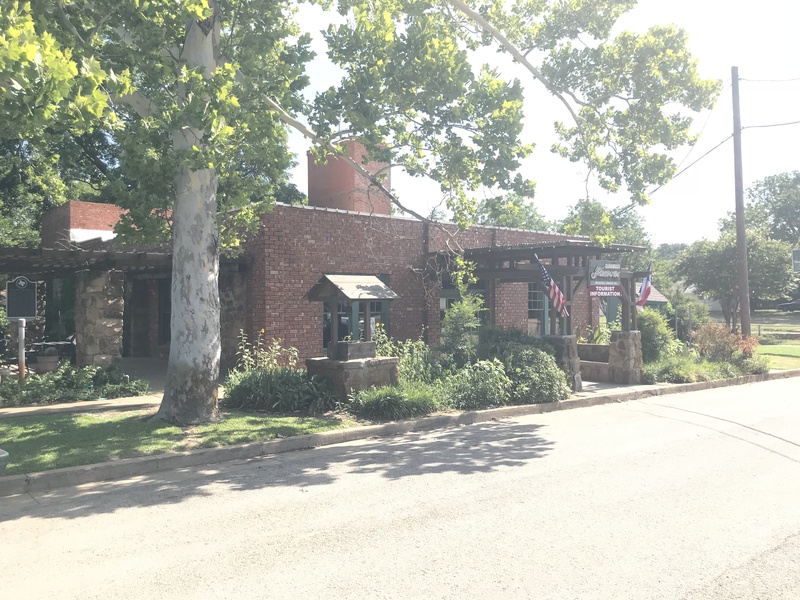 With a population of close to 15,000, Mineral Wells is one of those places that had a boom and bust story as a crucial part of its history. In 1880, a family that had settled in the area had a well drilled for a water source. Although the water that came from it tasted a bit funky, the family discovered that their bodies were feeling better after drinking it. The news of this went viral, and people from all over came to try out the magic waters for themselves. 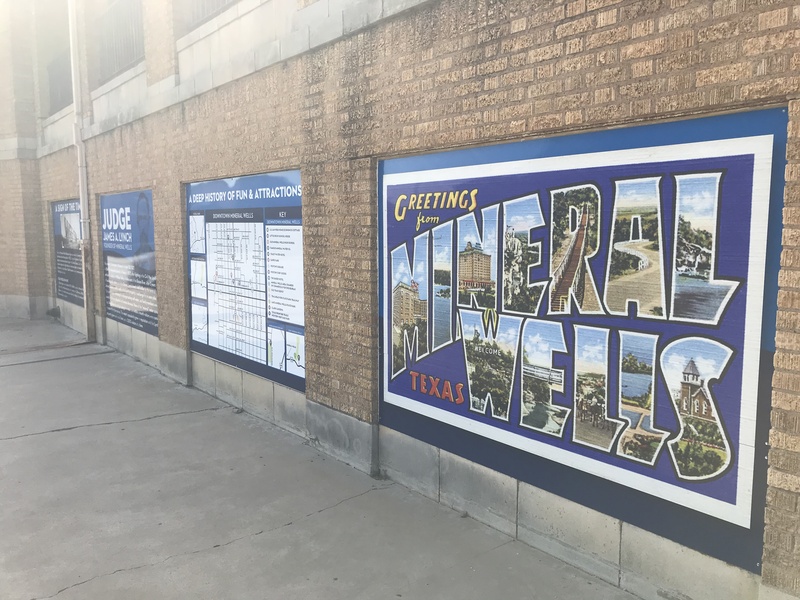 This uptick in people led to Mineral Wells being officially founded as a city in 1881. Much like what happened with the city of Marlin, the prosperity eventually came to a halt starting in the 30s. First, it was the Great Depression, followed by the FDA beginning to closely monitor medical advertising. The final nail in the coffin came in the form of advances in medical care, waning the interest in natural cures. 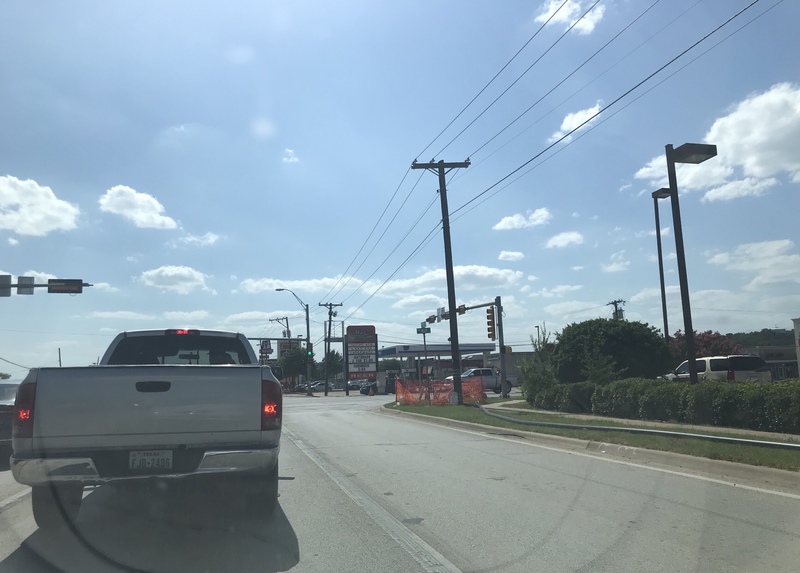 The drive into Mineral Wells was pretty smooth, except for a brief traffic jam on the way. Google Maps said the drive would be around an hour and a half, but we found that number to be closer to the two-hour mark. Upon arriving, we went to the place where the mineral water was: Crazy Water. You may be thinking “what a strange name!”, and a strange name it surely is. Of course, there is a story behind it. Right after the city was founded, numerous wells were drilled across town. One, in particular, had a woman that was suffering from dementia hanging around it all day, drinking the water. Before long, people noticed that she wasn’t as crazy as she used to be! When the news broke, even more people came to this bustling small town. From there, a company was born. 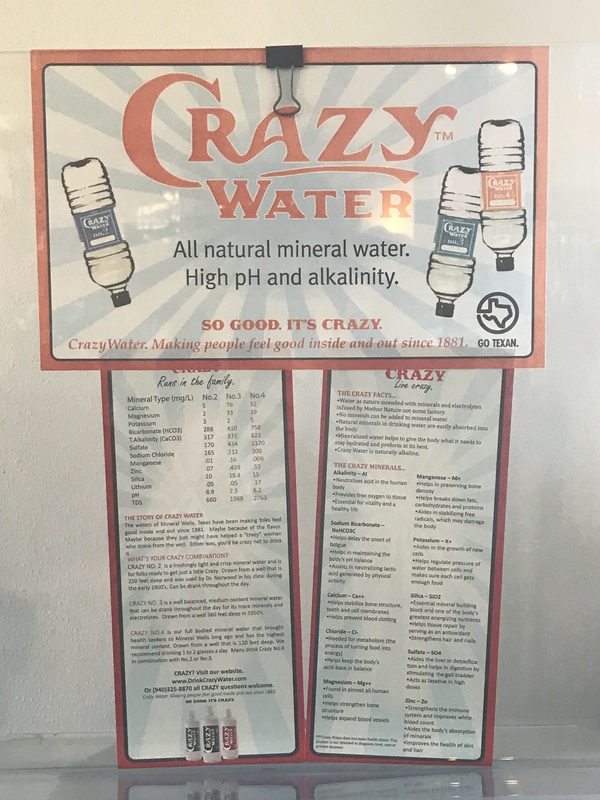 Crazy Water is the sole mineral water company here that survived the downfall of this industry, and today is the only place in town where mineral water tapped straight from the well may be obtained. 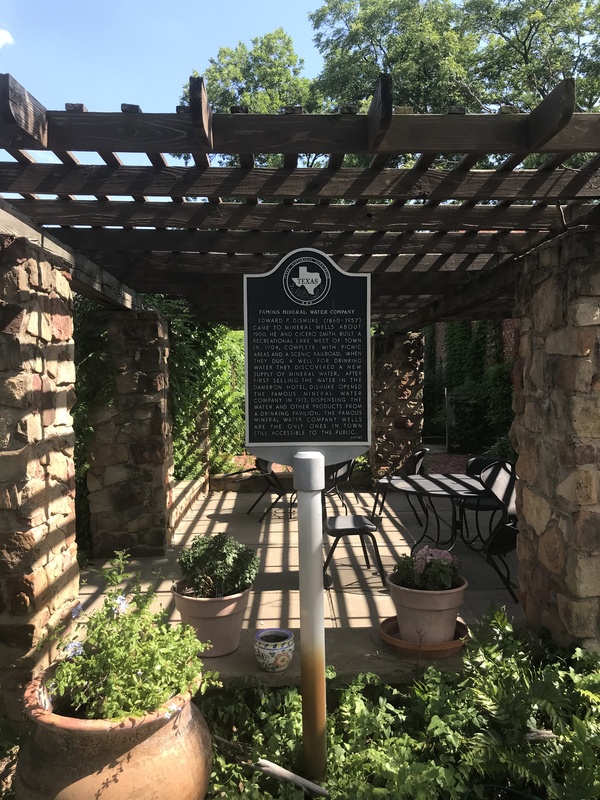 The historical marker for Crazy Water. Although it was almost closing time for this tiny store, there was a constant stream of foot traffic! 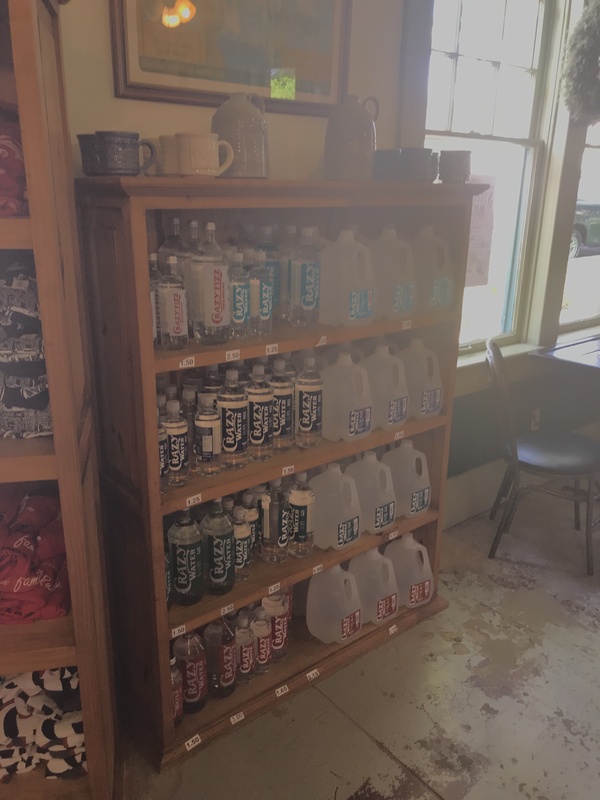 Some people were bringing in their five-gallon bottles for a refill, while others stopped by just to purchase bottled water. One thing that stood out to me was that their service was nothing spectacular. No one came up to us to provide an introduction, or even really greeted us for that matter. Regardless, we looked around and saw the bottles of water on the shelf, which is what we came for. There were four varieties to choose from. Their prices were reasonable. 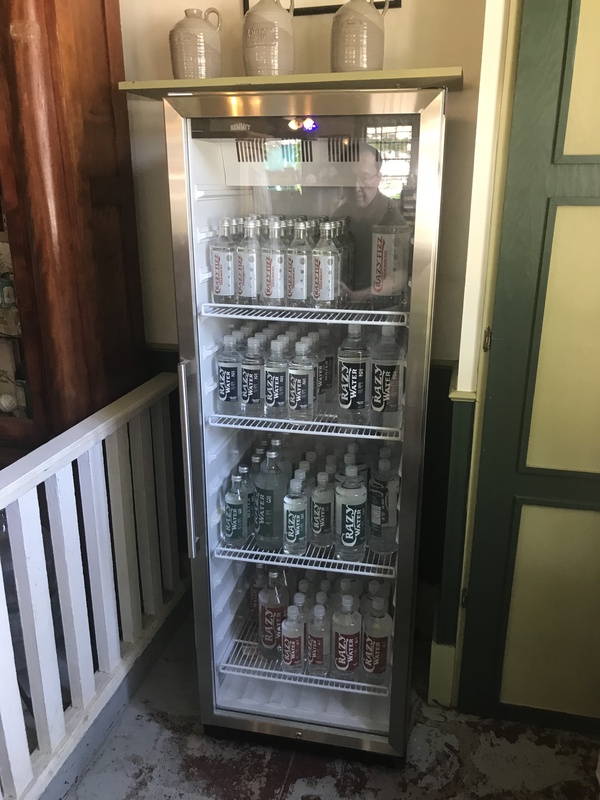 They also had water in a cooler, which we bought from. Didn’t seem too cold, though. 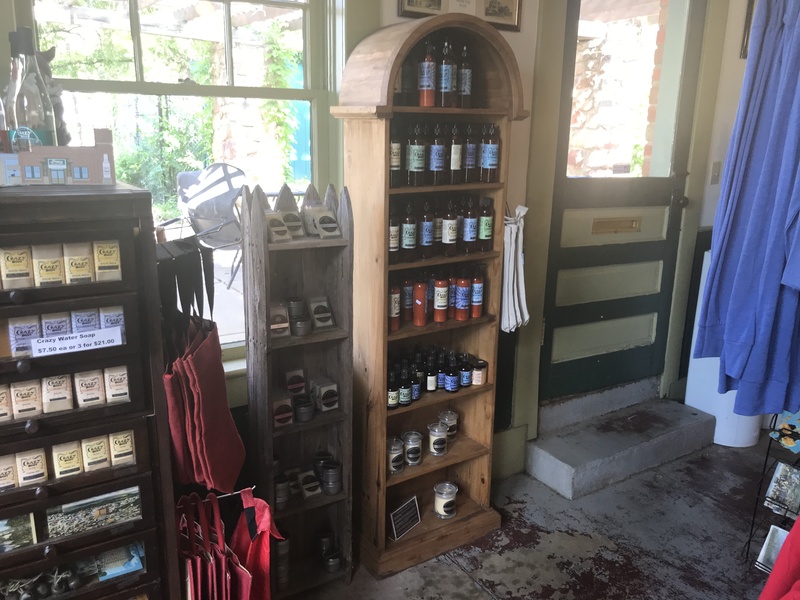 In addition to their main offering, this place also sold other mineral water infused items, such as soap and facial toner. We decided to buy their #3 variety, which we were told was the original flavor. Upon drinking it, it simply tasted different. Definitely felt saltier for one, but its something that one would have to try for themselves. One of the more notable special ingredients is lithium, something used in mood stabilizing medications to this date. Different varieties of their water yield different amounts of minerals. 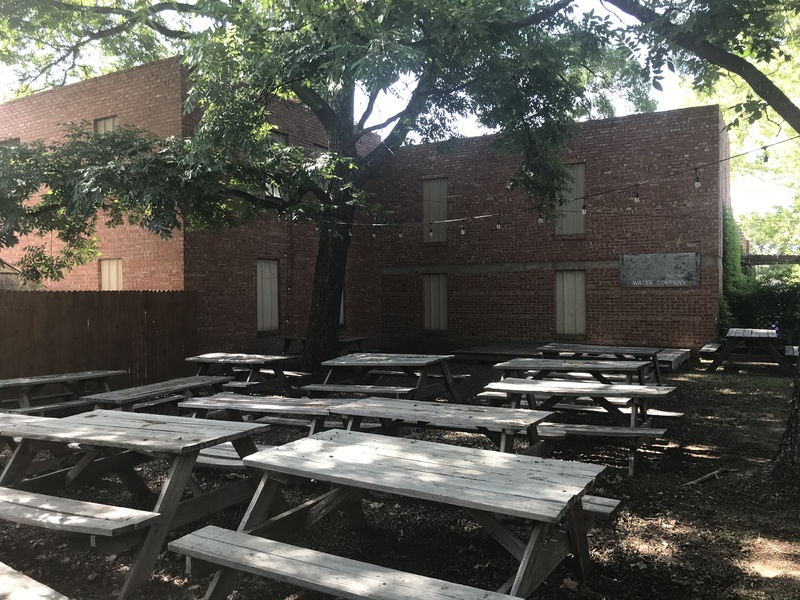 Walking around the exterior of the building, there was a little picnic/event area. Too hot to be doing anything out there right now, but during the spring or fall, it could be a nice place to relax and enjoy some of that crazy water. I wouldn’t be surprised if there was live music here from time to time. It would be a great gathering spot. Out of all the things I could possibly see here, a working well wasn’t one of them. I saw a suspicious looking shed..in fact, I saw two. I believe the wells are kept in there. I can’t imagine them being too far away. Hmm..what’s that green shed for? There was also a cool Route 66-like landmark of a water jug that I got my touristy photo op at. 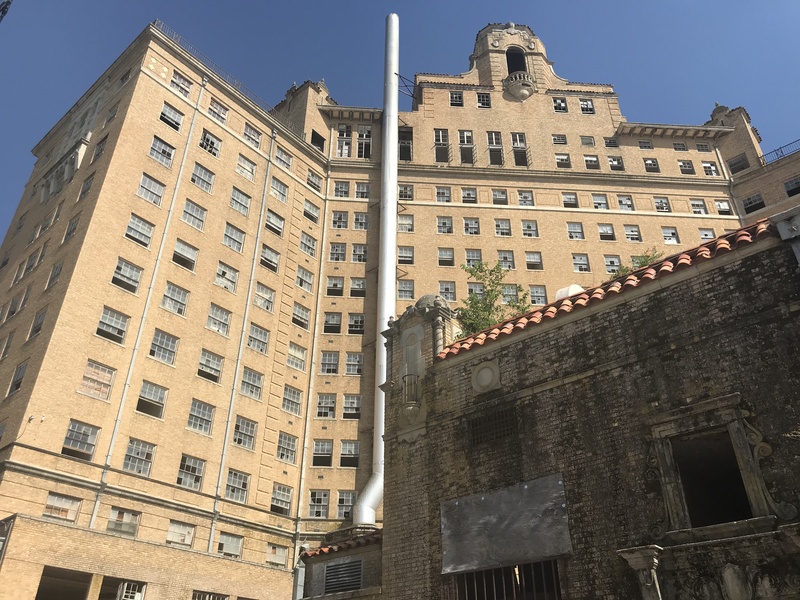 With us feeling a little bit less CRAZY hot, we took off for our next stop: the 14 story abandoned Baker Hotel, about five minutes away. 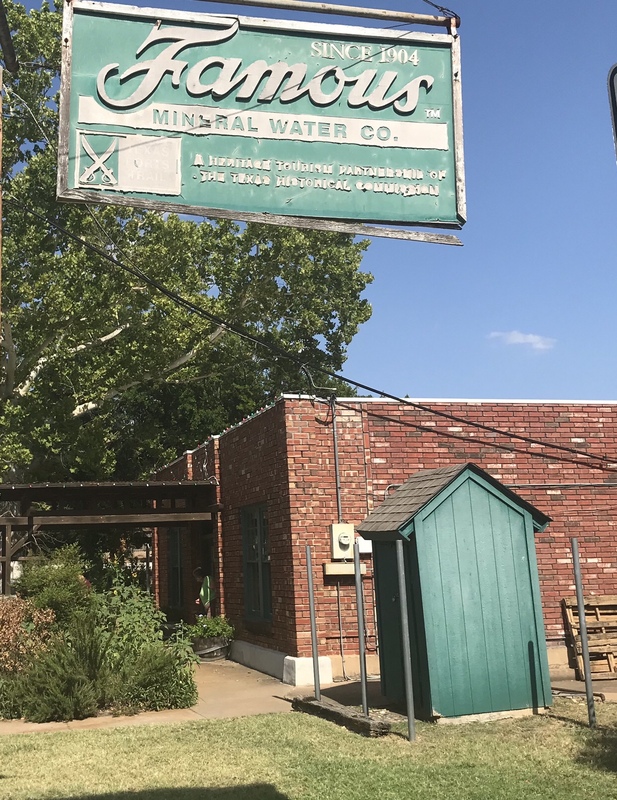 The history of the Baker is just as notable as that of the town it sits in. Opening in 1929, it was designed as a resort-style hotel. Its target clientele were people coming from all over the world that wanted to experience the mineral waters for themselves. Many famous people passed thru its doors, including Will Rogers, The Three Stooges, and even Bonnie and Clyde! Once an iconic place to stay and get mineral water spa treatments. When the mineral water frenzy died out, so did the Baker..slowly. 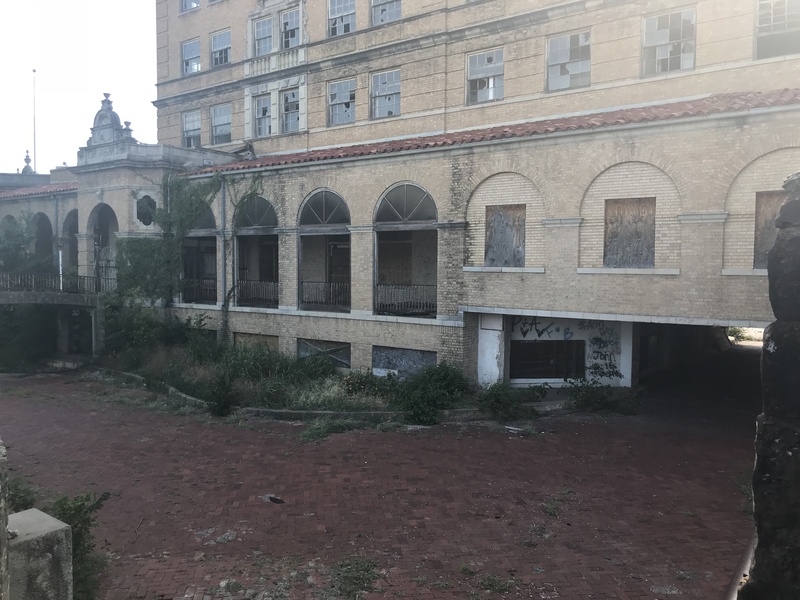 The hotel stayed open until 1972, when it finally shut its doors. Today, it is just as much of a tourist attraction as Crazy Water, perhaps even surpassing them. 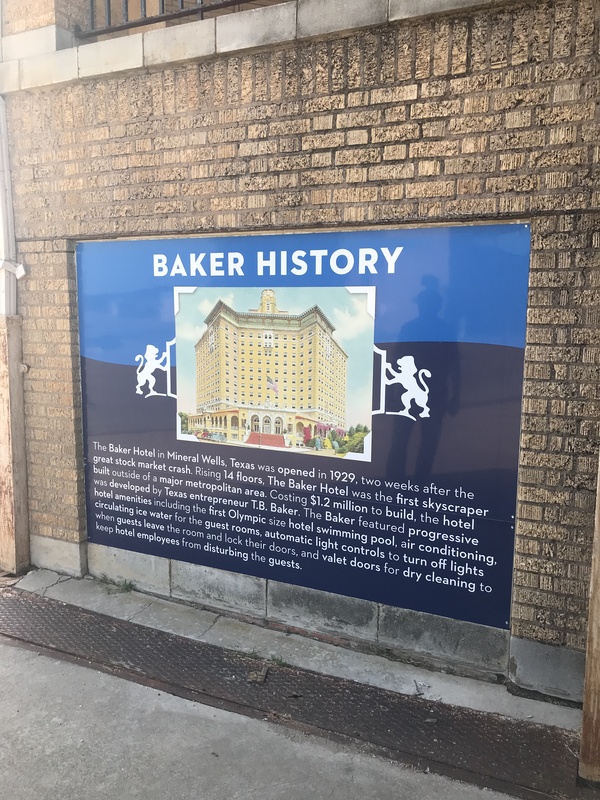 I had heard of the Baker numerous times, watching YouTube urban explorers like The Proper People check out the hotel. 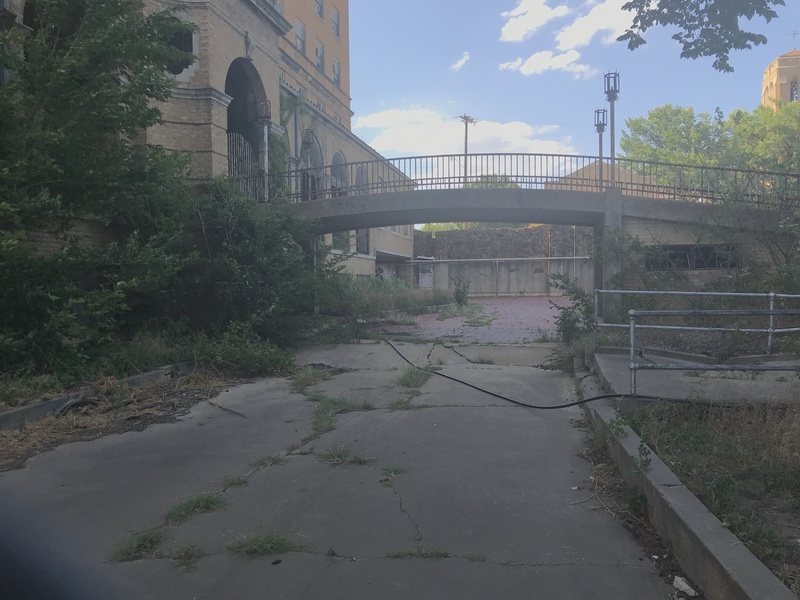 As someone that is into urban exploration myself, I had to see this place firsthand. This side entrance was probably used as a loading dock or parking entrance of some sort. Walking around the perimeter of the property, it was both super cool and somewhat sad at the same time. 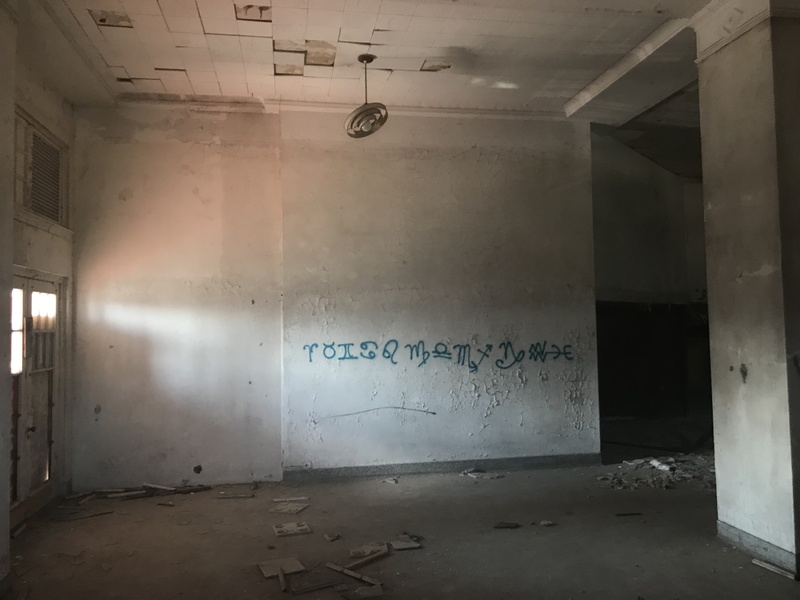 A lot of the windows were busted out, and graffiti was painted on many walls. Overgrown weeds fit into the picture perfectly, along with the peeling paint and weathered bricks. As I came up the front stairs, I noticed that there had been new signs posted up covering the front doors- something that I hadn’t seen from the YouTube videos of this place. Two of the signs had a viewing area, allowing people to see into the lobby! 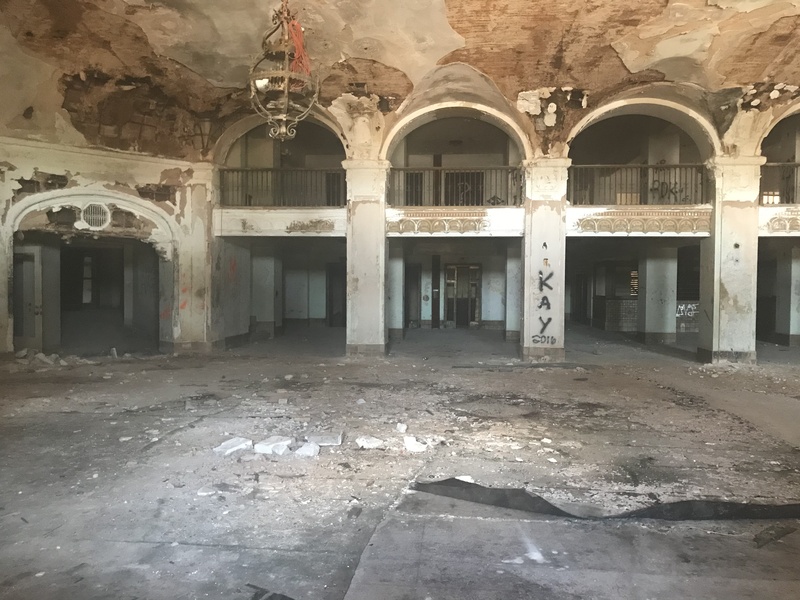 I could imagine this hotel in its heyday – guests coming and going, live music playing in the lobby, and the mineral water spa packed full of people. Today, it just stands empty and abandoned, like a reminder of the city’s past. This little bridge led to the pool and volleyball areas. Not sure what this room was for. Since it led to an exterior door, maybe as a side entrance lobby? If everything goes according to plan, this hotel won’t be sitting like this into the future. 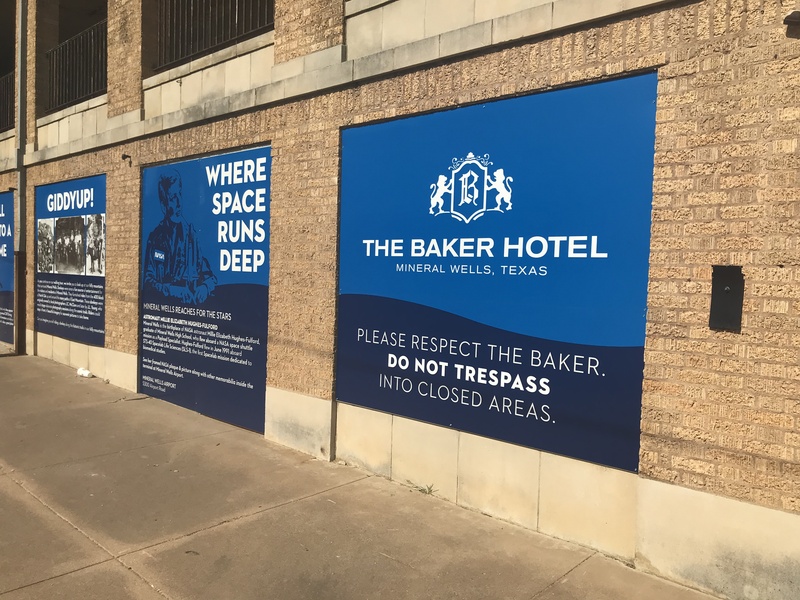 A proposal has been announced for a renovation and re-opening of the Baker as a hotel, complete with mineral water spas. 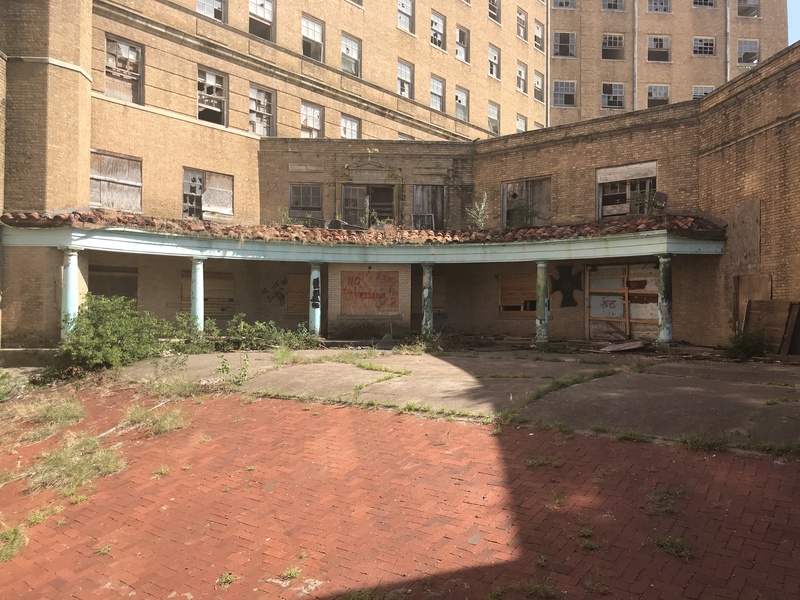 The developers have already put up signs on the downstairs windows, talking about the history of the hotel and the city, and redevelopment plans. There was also a big no trespassing sign, in addition to the other warnings spray painted onto the boards covering the windows. Needless to say, the owners have made their statement clear that they do not want any unauthorized folks in here. With a sign like this, it will be hard to fight a trespassing charge. Staying outside, you still can see a lot of the hotel, since not all of the windows are completely boarded up. 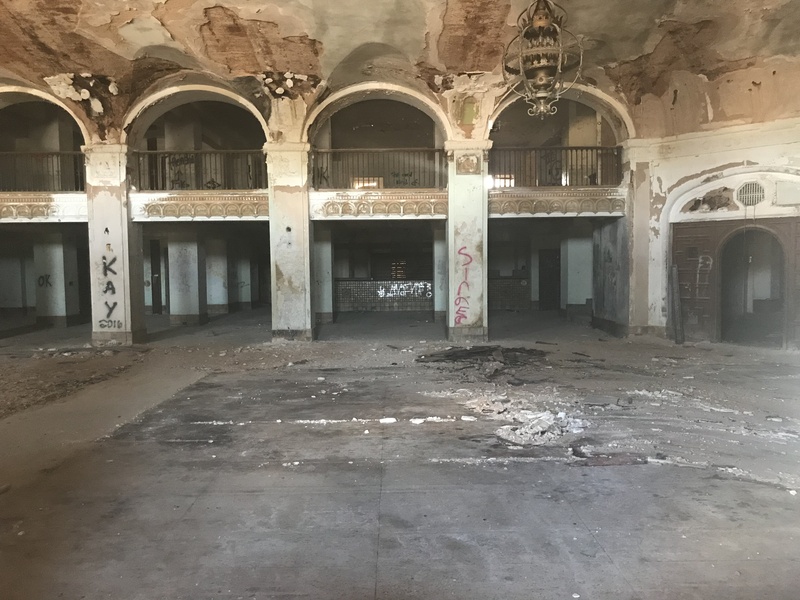 There are plenty of places where you can peep in, and see into this piece of history without getting in trouble. 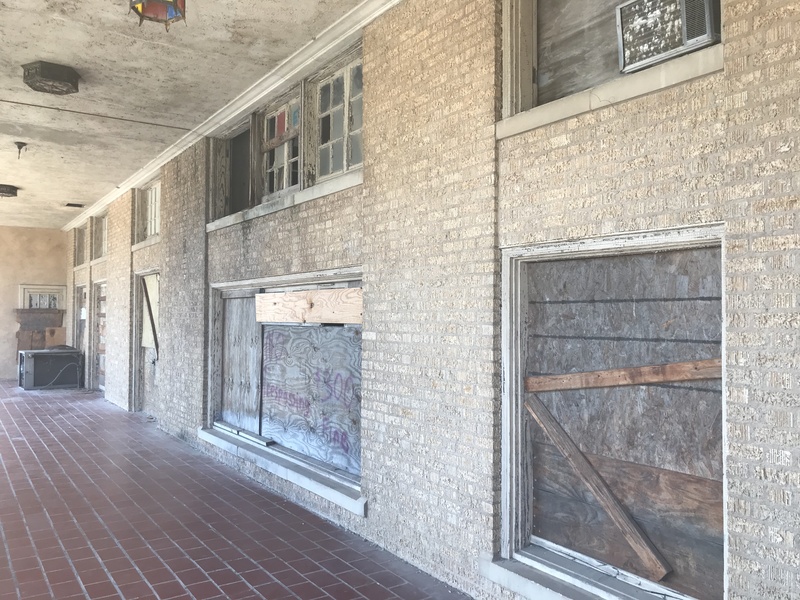 Maybe some of those windows weren’t completely boarded up on purpose, as to allow people to peer in. If you are like me, and enjoy looking at abandoned buildings, plan on spending a minimum of 30 minutes here. We didn’t stay too long checking everything out because of the intense heat, but a trip here when it’s cooler could mean quite a bit more time spent looking at the architecture. A pair of binoculars wouldn’t be a bad idea for looking in, all while refraining from getting a ticket for trespassing. 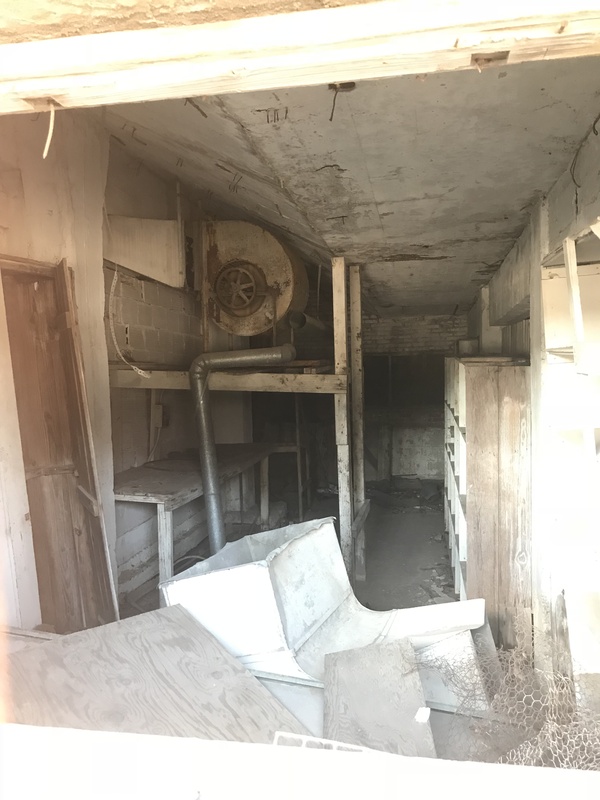 Some sort of storage room with a pretty antique blower contraption. Although it would have been nice to see some of the other attractions in town, such as the National Vietnam War Museum, we had to get going back home since this was a pretty impromptu trip. The US Post Office just down the street from the Baker. I have seen this design someplace else- just can’t remember where. Got that historic charm to it! If the chance ever comes around to explore the inside of the Baker legally, it’s an opportunity I’ll take in a heartbeat! Regardless, if and when the hotel does reopen, I will surely return and see what some TLC has done to this landmark. Since I’m already there, a stop to Crazy Water would probably also be in order. Off to the next place! Interesting article, was enjoying it. Love the details that you’ve added. I’m pretty sure it is going to be great when they reopen it. Yep! It would be nice if they didn’t restore a floor or two, so that it could be turned into a museum.